Who would like to join some of my kids and I to see #PenguinsMIA found in Madagascar this Sunday at IMAX at The Grove Mall in Pretoria? It is the movie event that will blow their cover… ! In partnership with whom did Ster-Kinekor and 20th Century Fox adopt four penguins? Leave your answer and details in the comment box with an email address I can easily reach you to win FOUR tickets to IMAX at The Grove Mall in Pretoria this Sunday! Will announce winners by midday tomorrow!! Movie starts at 12h00! … but do read what happens at 10h30! The mystery around the strange sightings of penguins in various parts of the city this week has finally been resolved, much to the relief of the public and the penguins’ counterparts, who are all still safely ensconced in their various penguin enclosures around the country! The identity of the four penguins spotted in all manner of crazy situations – bouncing on a jumping castle, catching a ride in a taxi, crossing the road and munching on cheesy snacks – are none other than our favourite ‘flippered’ friends, ‘Skipper’, ‘Rico’, ‘Kowalski’ and ‘Private’. You can see them strutting their ‘secret agent’ stuff as they “Hi-1” each other in solving the mystery of the slimy-green “bazooka serum”, in Penguins of Madagascar. Ster-Kinekor is releasing this much-anticipated film from Dreamworks® at its two IMAX® 3D theatres at Gateway in Durban and The Grove Mall in Pretoria on Friday, 28 November, a week before its national release on Friday, 05 December. But wait… there’s more! To announce the start of the summer holidays, Ster-Kinekor is giving penguin-lovers across the country the chance to catch the film before its national release date. On Sunday, 30 November, and Wednesday, 03 December, Penguins of Madagascar will have special pre-screenings at all Ster-Kinekor cinemas nationally, at select times. As South Africans become all a-flutter about the Penguins of Madagascar this December, the public can also make a positive difference to ensure the continued safety and care of our country’s famous penguin population. To tie in with the release of Penguins of Madagascar, Ster-Kinekor and 20th Century Fox are adopting four penguins – and are encouraging you to follow suit. The adoption of the birds is through a partnership with SANCCOB, the Southern African Foundation for the Conservation of Coastal Birds. Every year around Christmas time, SANCCOB receives numerous abandoned African Penguin chicks. In order to give these chicks a chance to grow into healthy, adult penguins, SANCCOB is appealing to the public to adopt a Christmas penguin chick. Your adoption entitles you to name the chick, while your donation will pay for its rehabilitation and release back into the wild. For more information on how to adopt a penguin chick this December, visit http://www.sanccob.co.za. If you go down to Ster-Kinekor The Grove Mall in Pretoria East or Bayside Mall in Tableview in Cape Town, on Sunday, 30 November, to catch one of the special screenings of Penguins of Madagascar, you’ll be in for an extra surprise! Penguins from Pretoria Zoo will be on display at The Grove, and SANCCOB’s special ambassador African Penguin, Rocky, will make an appearance at Bayside – both these events are taking place from 10:30 to 11:30 on 30 November. The public will be able to meet these wonderful creatures and learn more about the ongoing conservation programmes to ensure the survival of these iconic South African birds. It will also be the perfect time to adopt a penguin, before enjoying the spy-like antics of Skipper, Rico, Kowalski and Private on the big screen in Penguins of Madagascar! 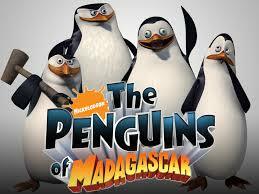 So, with the release of Penguins of Madagascar in IMAX® 3D at Gateway and The Grove; pre-screenings of the film on 30 November and 03 December at Ster-Kinekor cinemas countrywide; and the opportunity to get up close with these flippered friends at The Grove Pretoria and Bayside Cape Town on 30 November, there is no escaping the penguins this summer – unless of course, Skipper, Rico, Kowalski and Private have some other sneaky plan up their flippers… and escape first! For more information about Penguins of Madagascar at Ster-Kinekor and IMAX®, and to make bookings, download the Ster-Kinekor App on any Nokia, Samsung Android, iPhone or BlackBerry smart phone. Visit http://www.sterkinekor.com. To find out about other exciting offers and promotions, follow @sterkinekor on Twitter or on Facebook at Ster-Kinekor Theatres. For queries, contact Ticketline on 0861 Movies (668 437). Dress in black and white!